Sadly there is no shortage of tragic stories from Syrian refugees who are still suffering after five years of brutal conflict. But one I read recently resonated with me profoundly. It moved me while I read it. It stayed with me for days and days afterwards. It told the story of a Syrian family of two parents and four children. This was a well off middle class family, the father owned a pharmacy and the mother was accountant. They shared a house and a garden and experienced daily homework struggles and joyful weekly Sunday brunches. When the war hit too close to home and the children were not safe anymore, they headed to the Lebanese border with their savings. They rented a tiny piece of land where they started sharing a tent. As the years went on their savings started dwindling, to the point that even food became a luxury. The two twin girls, who both had plans to go to medical school, had to be married at 17 so at least they could be taken care of and the family would have lees mouths to feed. Six months ago their 15-year-old boy had to leave school and go to work in the fields. 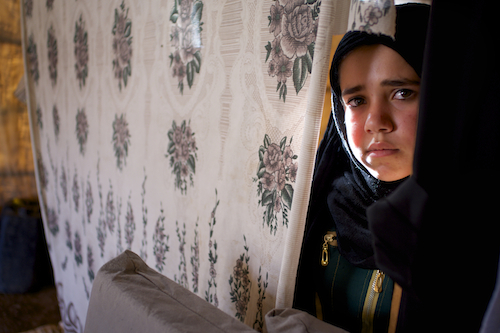 And today the last child, 9-year-old Amina had also to leave school, as they just could not afford it anymore. This story has stayed with me, because I see myself in each of them. I see my dreams shattered at 17 as I have to get married instead of going to University. I see myself exploited at 15 to work 12 hours a day. And I look at my own 9 year-old daughter and can't imagine how I would feel if I had to take her out of school. Do I wish I wasn't touched so deeply so I could move on with my own life? In 1956 many did not even have access to water and electricity and people moaned that the state should focus on providing these services before providing education. President Bourguiba was visionary enough to believe that education was the best investment a state could make. And he was right. The Nobel peace prize, which has just been awarded to the Tunisian quartet, also in part, belongs to him. Education is what has saved Tunisia again and again from drifting into chaos. Unfortunately today in emergency situations education is often seen as a secondary task. First, aid agencies, charities and states focus on health, security and education comes later with the devastating result that we are losing a whole generation of children in Syria. Instead we are unfortunately grooming recruits for jihadist and smugglers. The UN Special Envoy for Global Education, Gordon Brown, has called on businesses and states to deliver the finance to get 1million Syrian refugee children back to school. At Davos, business responded. Over 50 companies have committed $50million to the effort and more is expected to be announced on Thursday. It is not just about financial contributions, but practical suggestions and ideas -- technology for example can offer innovative methods delivering education to refugee children. As Heads of State arrive in London for the "Supporting Syria" Pledging Conference on February 4th, they have an unprecedented opportunity to support this plan and other programs to get every Syrian child in school. I don't believe that this issue can be left in the too difficult tray -- indeed there are compelling moral, economic and security reasons why it must not. Dr. Amel Karboul is Secretary-General of the Maghreb Economic Forum (MEF) and member of the International Commission on Financing Global Education Opportunities. She was until Feb 2015 Minister of Tourism in the Tunisian transition government that has been appointed after the successful quartet negotiations. She recently published her newest book Coffin Corner; outlining a new leadership culture suited to the complexity and dynamics of the 21st century!